More than enough has been said about how technology is changing the world of work. And how organizations should change with the times. Of course, the focal point of all this is to better the way we work. But within all this chatter comes an understanding that change and adaption to it, cannot grow and flourish unless we embrace it. Now, within this giant notion of enhancing the way we work there exists a process referred to as “remote work” or “telecommuting.” This way of life continues to draw more attention. 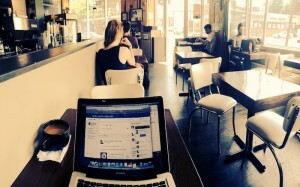 A Gallup study found 39 percent of employees have already worked remotely. It’s a small sign that organizations are beginning to question and search for new ways to invest in their employees’ happiness. And obviously organizations should, considering Gallup did the math and found that 70 percent of the U.S. workforce is disengaged at work. This couldn’t come at a more inconvenient time when the war for talent has never been more fierce and employees couldn’t be more self-aware of what drives their professional needs and wants. As someone who works remotely for a living, I’ll admit that I love working from my laptop inside the local Boston coffee shops. And even though there is no after work social hangouts with my central time colleagues and I, life as a remote worker is good. I understand the pros and cons of working remotely. I am not bounded by traditional work schedules. I am not confined to a cubicle. I can live and work from wherever my heart desires. But the experience is not always as tasteful as biscuits and gravy. Being a remote worker requires diligence and a different level of commitment than traditional office employees. I have to constantly micromanage myself, understand what tasks need to be prioritized, and hold myself accountable for my work, more than my employers have to. While we all need to work on mastering our communication skills. I can’t begin to stress enough how vital communication is when remote working is taking place. There are all kinds of fancy tools available to keep communication on the same wavelength like Skype, Yammer, and let’s not forget email. But that’s not the secret to success with remote workers. Yes, these tools help to connect people together, but being on the same wavelength requires talking and being transparent about the work that needs to be done. Assigning remote workers projects means leaders need to make themselves available for Q&A, especially in the beginning, but this also means remote workers need to be ready to ask questions. Apparently, Kipp Jarecke-Cheng, director of global public relations and communications for Nurun, a design and technology consulting company based in Montreal, knows a thing or two about remote working, based on a recent article published by the New York Times. Initially, he found it a bit of challenge to communicate with his colleagues. He mentions, “Probably one of the biggest transitions was that in a physical office, you can stroll by and ask questions,” an initial challenge that I’ve had to face as well. “Here I have to accumulate a list of questions,” said Mr. Jarecke-Cheng. Part of getting on the same wavelength requires finding an outlet to manage communication through effectively and making good use of that outlet by being prepared to talk and discuss the work that lies ahead. Of course, this only works when both sides make themselves accessible to the work that needs to get done. Because remote workers work out of office, there needs to be a certain amount of time set aside to communicate with each other. Just like there needs to be a significant level of trust as well. Response time is everything. Both sides have to be able to connect with each other through an arranged schedule. Something that lets both sides know that at certain times, on certain days, so and so can be reached by Skype or email. This is really important for building communication and trust. Because with remote workers, accessibility doesn’t end with communication, it extends into the deep depths of an organization’s operational systems and confidential information. Meaning, remote workers need to be able to move around freely to access resources and information they will need. This is done by minimizing or eliminating any roadblocks remote workers may encounter. Leaders need to understand that having a successful remote workforce means being personally and organizationally accessible to them. Email is great, but it’s not the same as having a five-minute personal phone conversation with someone. Trust me on this, it just resonates better with people and makes the experience feel more interactive and personal. You have to be able to communicate, be accessible, and last but not least, you need to be able to give feedback. Just like anything else, remote working needs continuous fine-tuning. Because, “Remote relationships take more time to manage than those that are not remote, and that’s on both sides,” a relatable statement made about remote work management by consultant and former Society for Human Resource Management Chairman Libby Sartain, SPHR, CCP, principal of Libby Sartain LLC and former chief people officer at Yahoo. The better you get at understanding how it works, then the better your results will be. Both sides have to be able to communicate what’s working and what’s not. While I appreciate hearing “thank you” or “nice job,” it’s actually really important that I understand what it is I’m doing right or wrong, and that comes through making myself receptive to feedback and leadership not tiptoeing around the truth. By keeping remote workers in the loop through feedback you can foster trust and growth. The thing with working remotely is you can quickly feel lost and alone if there’s no feedback. While feedback does tie back into having great communication, it also makes working remotely more transparent. Remember, good work can come from anywhere. Good feedback can only come from building trust. Believe it or not, but the better you get at communicating, being accessible, and giving feedback, the more efficient you’ll be in general. A couple of weeks ago, one of my bosses asked me to complete a social media report on the fly (hours before a scheduled meeting) for one of our clients. We punched that project out with no problem because we harnessed the power of communication by jumping on a quick Skype call to work out the kinks. We worked efficiently while under pressure to get the report done without any major setbacks because we are on the same page when it comes to knowing what needs to be done. Having a remote workforce is not for every organization. It’s also not for every professional. Companies need to understand why it does or doesn’t make sense to have a remote workforce. Chris Byers, CEO of Formstack, an Indianapolis-based online form and data-collection platform, has about 40 percent of his employees living outside of Indiana. He has found a few reasons why remote working is attractive: hiring for specialized positions, workplace flexibility reduces stress, and improved employee retention. This is great, but it also comes with the need for professionals to understand whether they possess the personality traits necessary to be successful remote workers. Succeeding at remote working is possible and it doesn’t have to be a difficult process. It is something organizations and employees have to sit down together (even if it’s a virtual meeting) and workout any bugs that could hamper its success. Because remote workers are not going anywhere and neither is this way of work.